August 7, 1945 Alan Cedric Page, hall of fame football player and judge, was born in Canton, Ohio. Page played college football at the University of Notre Dame and led them to the national championship in 1966. That same year he was named All-American. 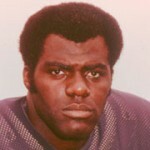 In 1967, Page earned his Bachelor of Arts degree in political science and was selected by Minnesota Vikings in the NFL Draft. Over his 15 season professional career, Page was a 9-time Pro Bowl selection, 1970 and 1971 Defensive Player of the Year, and the 1971 Most Valuable Player, the first defensive player to be named MVP. Page was inducted into the Pro Football Hall of Fame in 1988 and the College Football Hall of Fame in 1993. In 1978, Page earned his Doctor of Jurisprudence degree from the University of Minnesota Law School. In 1985, he was appointed Assistant Attorney General for the State of Minnesota and in 1992 he was elected to the Minnesota Supreme Court, the first African American to serve on that court. Page continues to serve as an associate justice on that court. In 1988, Page founded the Page Education Foundation to provide financial and mentoring assistance to minority college students. A book titled “All Rise: The Remarkable Journey of Alan Page” was written about his journey. To date, the foundation has awarded grants to 4,100 students. In 2001, Page was named to the Academic All-American Hall of Fame and in 2005 he was awarded the National Football Foundation Distinguished American Award.